Lightweight, durable sign panel with a corrugate polypropylene core. The EconoCorr® sign panel features a corrugated polypropylene core with an aluminum finish on both sides. It offers a lightweight core and durability. Its resistance to corrosion and rust makes this sign panel ideal for exterior use. 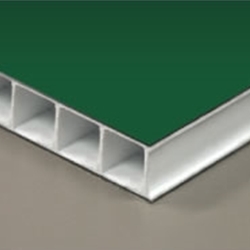 EconoCorr® is a single sided economical alternative to AlumaCorr™.